This 8-gauge L.C. 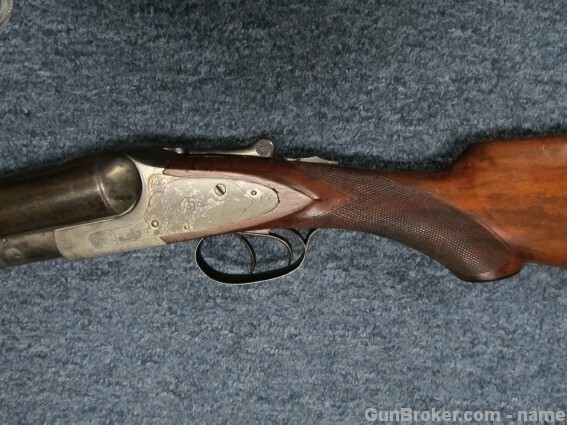 Smith side-by-side, double barrel shotgun is on Gunbroker right now. The seller says it has 32″ barrels. From the pics, it looks like it might be a No. 1 grade. L.C. Smith made very few 8 gauges – estimates vary from 30-35. From what I’ve been able to find out, they made them from about 1895-1898 and every one was hammerless. This guy here has several 8-gauge L.C. Smiths, at least two in No. 2 grades. Of all the major American makers, Parker made the most 8 gauges – hammerless and hammerguns- and Lefever made the fewest. Baker made a few, and Colt made at least one. A.H. Fox never made any. Eight gauges used to be very popular for wildfowl. They pushed a ton of lead and this made them ideal for swatting flocks of birds at a time – just what a market hunter on the Chesapeake Bay wanted to do. Eight-gauge shotguns were outlawed for use on waterfowl in the US in the early 20th century. BTW: if you have an 8 gauge double, or you know of any out there, please let me know. I’m interested in purchasing one and will pay a finder’s fee for a nice one. I have one of these shotguns, an L.C. Smith 8 gauge. Serial# 417XX. There are dates on the receiver Mar 29,83, July 13,86 and Oct 5,86 (sic) probably patent dates. This piece has not been refinished. There is no blue on the barrel (not sure there ever was). The receiver is heat treated (not sure what that is called) but is not as colorful as some pictures I have seen. The stock seems to be made from a high grade English walnut . It has some bumps and dings but is still very solid with no cracks or splits. Same for the foregrip. The numbers on all three parts are matching. The bores are bright but the right side shows some erosion by firing, not rust. So, what do you think?